Kellagher was a member of the Fordham team that appeared in the 1941 Cotton Bowl. Following service as a Marine during World War II, he joined the Rockets of the new AAFC in 1946. As a fullback on offense, he rushed for 178 yards and three touchdowns and caught two passes. Rockets went 1-13 to finish fourth in the AAFC Western Division. Kellagher played one more season for the Rockets, gaining 97 yards on 33 carries and scoring a TD, and had no interceptions on defense. 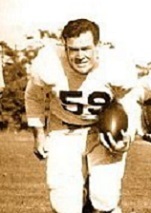 He moved to the NFL with the Pittsburgh Steelers in 1949 but was a late preseason cut and spent his final season with the Bethlehem Bulldogs of the minor league AFL, rushing for 158 yards. For his three years in the AAFC, Kellagher gained 518 yards on 124 rushing attempts (4.2 avg.) and caught five passes for 58 yards, scoring four touchdowns. His six interceptions in 1947 were also his AAFC career total.